Hoping to crack the magical 30" mark soon! All fish were broad, healthy looking and looked well fed, lol. I've gotta find a fishing partner! Lol. These pictures on the ground don't do the size of these fish any justice! 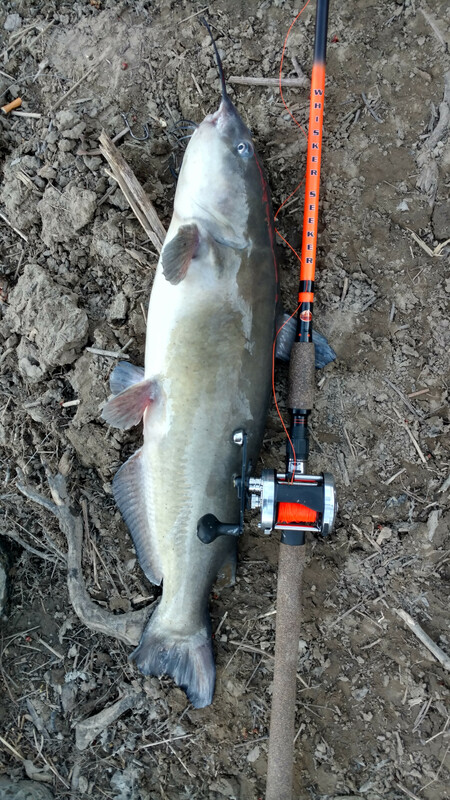 What made me fall in love with channel cats as a true sport fish is how they absolutely crush the bait, especially as the water warms up a bit and how powerful they are once hooked. 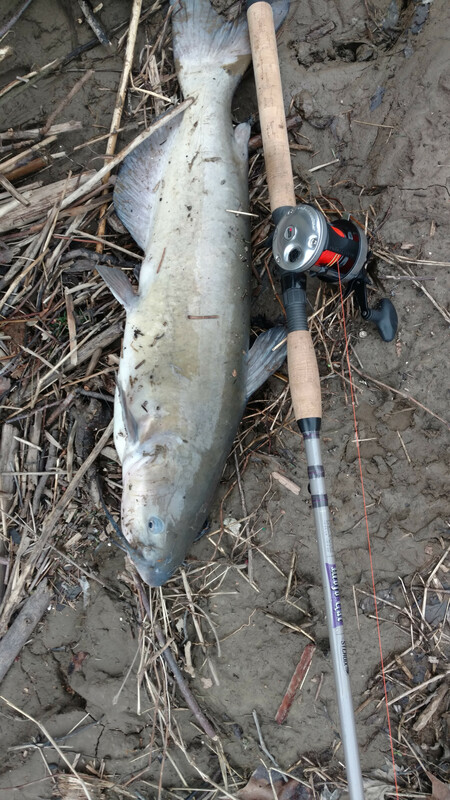 My cat rods are all medium heavy power rods with 20 lb test line and those bigger cats definitely give you a hard time, even with the set ups I use. It's an awesome feeling to hook into something that can sometimes pull back almost as hard as you can. I've got my boat squared away for the season and I'll definitely be giving the flatheads a whirl this season. I would love to try to tustle with one of those beasts! I am an older geezer who has used monofilament for everything over the years. I've tried the no-stretch braids and spider wires but can't seem to get use to them. I see you have bright red/orange line. Really bright. 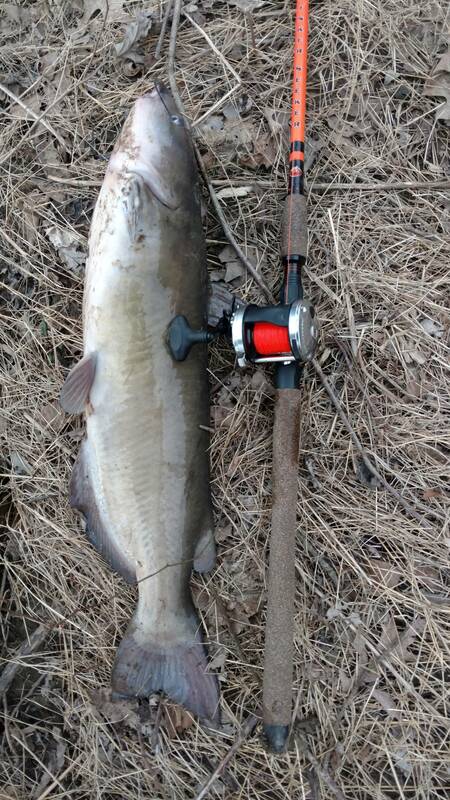 Clearly the catfish are not line shy of the red color. Is there a particular benefit to bright red line? I assume it is a braid or spider wire? Does it even appear red in deeper water? I agree wholeheartedly. I too have used braid/superlines and I'm not a fan of them either. They're zero stretch properties have a pretty substantial learning curve, especially when it comes to setting the hook, a learning curve that I do not possess, lol. I do use PowerPro, but only in specific situations and it does perform well. I only use braid on my heavier laregemouth bass set up and I use it exclusively for fishing frogs in heavy vegetation mats and timber, 40 lb braid gets them moving in the right direction in a hurry. I agree,cats are a riot. I don't care for the reels you use,because I can't cast them.lol.i use baitrunner spinning gear.i bet Dave turned you on to them reels.hes a champ with them. I have no time for Cats this spring. Work is killing me.Thisvis the best time of the year for them. I'm glad your having some sucess.I can't wait to see the spammers Dave gets this spring. HOW ARE YOU GETTING OVER THE FENCE? Keep the pics comming ,I enjoy them bigtime.